— The California primary on June 5 is the most important election in the battle for the House prior to November. — Democrats are hoping to avoid getting shut out of November by the state’s top-two primary in multiple districts, and the results should provide a rough guide for the fall. — Tuesday’s primary results did not prompt any ratings changes but did set up some interesting matchups for the fall. — One ratings change in the House: Rep. Ralph Norman (R, SC-5) moves from Likely Republican to Safe Republican. We also have a pending change in store if Rep. Tom Garrett (R, VA-5) decides not to run for a second term (explanations below). — Odds of a Democratic House takeover remain about 50-50. As the Democratic edge on the generic ballot has weakened in recent weeks, there has been a flood of second-guessing about whether the Democrats are favored in the House or not. Because we’ve never made the Democrats clear favorites in the House, though, we don’t have any modifications to our outlook. House analysts know that handicapping results in individual seats can be tricky for a lot of reasons, including the lack of independent polling in most districts. Yes, the party committees, campaigns, and other outside groups will survey the districts, but many of these polls will never see the light of day, or will only be leaked to make one side look better than the other. So, with a dearth of polling, we’re looking for whatever shreds of data we can find as a guidepost on the road to November. The much-anticipated California primary, coming on June 5, is one of them. California, unlike almost every other state, uses a top-two primary system to advance candidates to the November general election. That means every candidate regardless of party appears on the same ballot, and voters can only vote for one of them. This can sometimes lead to one party getting shut out of the general election. For instance, Republicans did not advance a candidate to the 2016 Senate general election, when now-Sen. Kamala Harris (D-CA) beat now-former Rep. Loretta Sanchez (D, CA-46). And Democrats got shut out of the general election in a very winnable seat (CA-31) in 2012 and a potentially but probably not winnable seat (CA-25) in 2014. The intricacies of the top-two format explain why the Democratic Congressional Campaign Committee and its allies have had to dump several million dollars (so far) into three Republican-held Southern California seats, CA-39, CA-48, and CA-49, before the primary because the Democrats are worried about not advancing candidates to the general election in one or more of those districts. This is why the California primary is by far the most important House primary this year, and not just because California has the largest share of U.S. House seats (about one-eighth of the 435 total, 53). Rather, it’s mostly because the California primary could decide races in June. For instance, we rate CA-49 — an open Republican seat held by the retiring Rep. Darrell Issa — as Leans Democratic, making it one of the top Democratic pickup opportunities in the whole country. But it would immediately move to Safe Republican if two Republicans make it through the top-two primary (or Safe Democratic if two Democrats make it through, as seems possible albeit remote). That’s different from other primaries, where sometimes a candidate with a lesser track record makes it through the primary over a candidate preferred by party operatives — like when nonprofit executive Kara Eastman beat ex-Rep. Brad Ashford in Nebraska’s Democratic primary last week. That prompted us (and others) to upgrade the chances of Rep. Don Bacon (R, NE-2), even though Eastman very well could beat Bacon anyway. Yet if a party strikes out in the top-two system, that party’s chances fall to 0%. Beyond the potential for general election shutouts, though, the top-two primary also provides something of a preview for the fall. 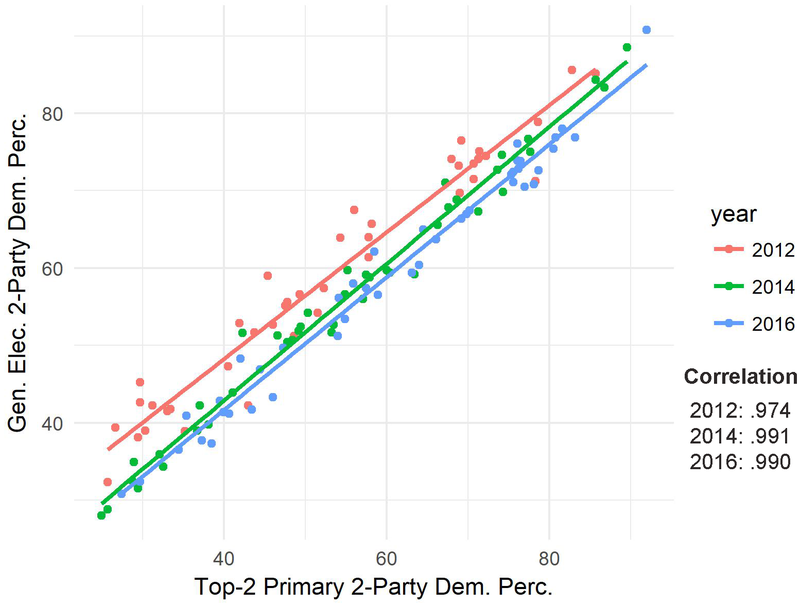 Although the two-party voting in the primary is not a perfect predictor of the general election, the Democratic two-party percentage in the top-two primary and the Democratic two-party percentage in the general election were almost perfectly correlated in 2012, 2014, and 2016. 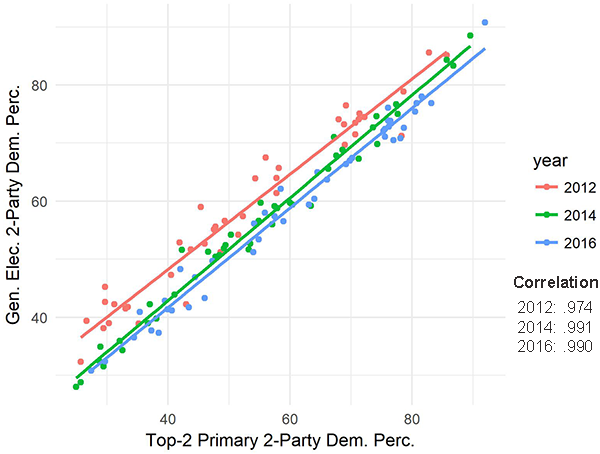 Chart 1 illustrates this by showing a scatterplot of the data for two-party contested congressional districts and their Democratic two-party vote shares in June and November. So, in our quest for any shreds of information about House races, the top-two primary vote does provide some insights. Notes: Includes only districts where there was two-party competition in the primary and general election. 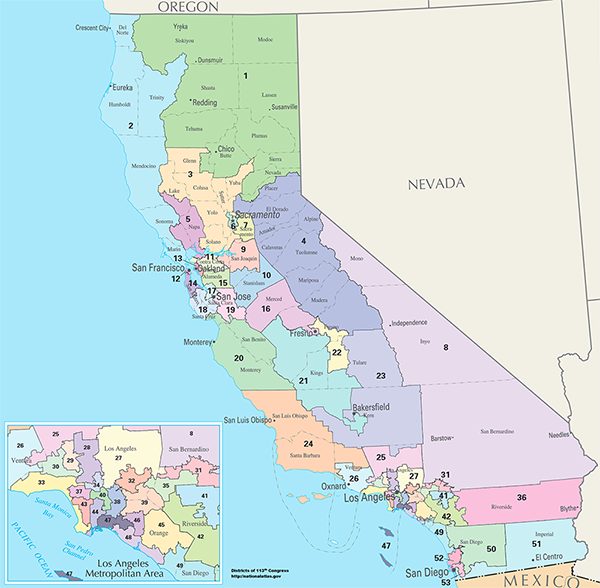 California has used the top-two primary for three cycles, dating back to 2012, which also coincides with the state’s adoption of its current congressional map. Table 2 shows the House results for all 53 California U.S. House districts in the three elections that have featured the top-two format: 2012, 2014, and 2016. The table excludes all third-party votes cast in the primary, so it just measures the percentage of total Democratic and Republican ballots cast in the primary and the general. Races where two Democrats, two Republicans, or a major-party candidate and a third-party candidate advanced to the general election are excluded (those are the spaces that are blacked out). The number reported is the Democratic share of the two-party vote and the “D+” column is how the Democratic share changed from the primary to the general election. If you’re curious about the Republican share, just subtract the Democratic share from 100. So, if the Democratic two-party share is 55%, the Republican share is 45%. The column on the far right is the average change in the Democratic share from the primary to the general election in all three elections, and it only includes districts that featured two-party competition in all three cycles. Only 28 of the 53 House districts satisfied the three-cycle criterion, which means that it’s relatively common for the general election to lack two-party competition in at least a handful of districts each year. Notes: Instances where write-in candidates advanced to the top-two election were excluded, and the totals for write-in candidates were omitted even when those candidates were members of major parties. District numbers are shaded by current party control, and negative numbers in the “D+” (change in Democratic vote share) column indicate that the Republican, not the Democrat, gained vote share from the two-party performance in the primary. The general rule in California is that one would expect the primary turnout to be more Republican-leaning than the general election. The reason is the same reason why one might expect that in other parts of the country: The Republican electorate is older and whiter, two demographic factors that generally predict more reliable voter turnout. This year, we’ll probably see something similar: Politico reported that 32% of the roughly 650,000 returned absentee ballots have been from registered Republicans according to the nonpartisan California data source Political Data, a turnout that is outpacing statewide Republican registration, which is about 25%. That the primary electorate likely will be more Republican than the general electorate is an additional wrinkle that could hurt Democratic chances to advance candidates to November in one or more of the aforementioned districts. Of the three elections held under the top-two, 2012 provides the best example of a more Republican-leaning primary electorate. 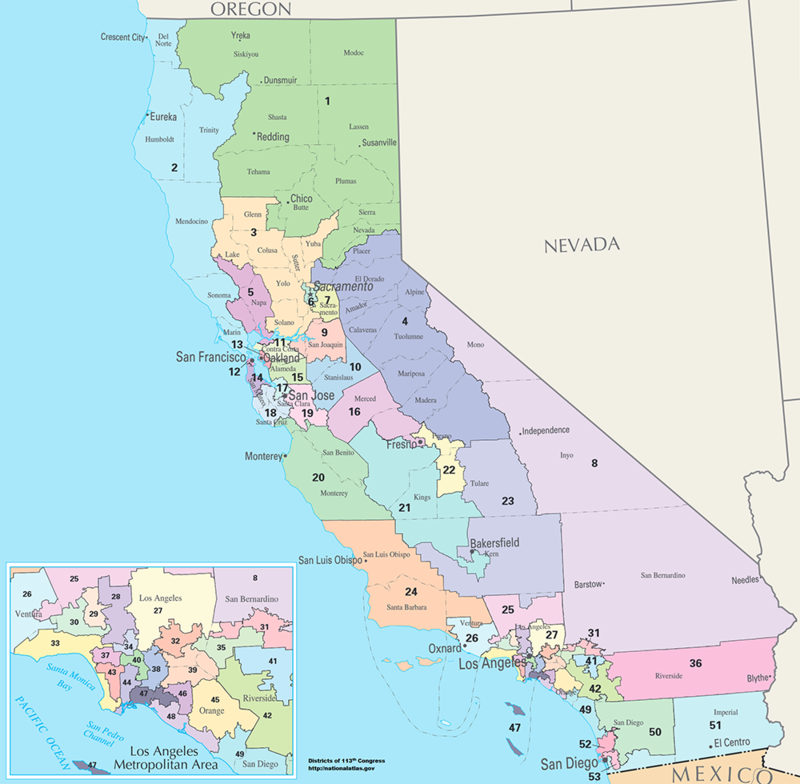 While 2012 was a presidential year, the California primary wasn’t held until early June, long after Mitt Romney had effectively locked up the Republican presidential nomination (and incumbent President Barack Obama did not have a major challenger on the Democratic side). Turnout was just 22.5% statewide, and the electorate seemed Republican-leaning, considering that the Democratic share of the two-party vote increased in nearly every district from the June primary to the November general election, as Table 2 makes clear. Overall, the total Democratic share of the two-party vote grew by an average of about six percentage points in each district, or a whopping 12 points in terms of margin. That immense growth, combined with new House districts, allowed Democrats to net four seats statewide, going from 34 to 38 seats overall. Democrats did suffer an embarrassing top-two shutout in CA-31, a district that Obama would go on to carry by 17 points. Then-Rep. Gary Miller (R) seemed like a goner, but he and another Republican advanced to the general election over a splintered field of Democrats that included Pete Aguilar (D). Aguilar would go on to win the seat in 2014, a rare Democratic bright spot in what was mostly a bad year otherwise. It’s worth noting, too, that Miller and the other Republican won 51.5% of the two-party vote in the 2012 CA-31 primary, yet another indicator of the Republican lean of that year’s California primary electorate. Two years later, Democratic strength again generally grew from June to November, although not by as much as 2012 and not as consistently across districts. This makes some sense because Democratic turnout was weak all over the country in 2014, including in California: total votes in the state’s governorship race fell from about 10.1 million in 2010 to 7.3 million in 2014. Despite the weak turnout, and despite some close calls, Democrats did not lose any seats in California and, as mentioned above, Aguilar won CA-31, although not by a lot, creating the party’s current 39-14 majority in the state’s congressional delegation. CA-25, an open Republican seat, saw two Republicans advance to the general election, including now-Rep. Steve Knight (R). A Democrat probably would not have won the seat that year, but former Rep. Buck McKeon’s (R) relatively weak performance in his final election in 2012 may have been an early clue about the GOP’s weakening hold on the exurban Los Angeles district. Clinton carried it by seven points and Knight only won by six points in 2016, and Democrats will target him again this year. In the 2016 California election, Democrats fell off a little bit from the primary to the general election, although there’s an easy explanation for this. The Democratic primary between Hillary Clinton and Bernie Sanders was still going on, and it drove an unusually large Democratic turnout in the June primary. Meanwhile, the Republican primary was effectively over, and the party had chosen a nominee in Donald Trump who was a poor fit for California (as would become clear in the fall, when Trump turned in the second-worst performance by a Republican presidential nominee in the state’s history). Democratic two-party House shares generally fell in more places than they increased from June to November, and no seats changed hands between the two parties even though the Democrats hoped to net seats in California. Still, the change from June to November was minimal: On average, Republicans gained just 1.2 points of vote share. One of the most notable results from the June primary was in CA-49, where the typically untouchable Issa only won 52.7% of the two-party vote. He won by less than a point in November as Clinton carried his district, and now he’s retiring. Predicting the June 5 primary turnout is challenging, but there’s reason to expect that the Democrats will not replicate their big 2016 primary surge in California. The main reason is that it’s not a presidential year and there’s not a competitive presidential primary to disproportionately drive Democratic rather than Republican turnout. That said, Democratic turnout could benefit from statewide gubernatorial and Senate primaries that hypothetically could advance two Democrats to the general election in both statewide races (that seems likely in the Senate contest, less likely in the gubernatorial election), and Democrats have generally (not always) been more eager to vote in primaries nationally this year than four years ago. Still, one would probably expect the average Democratic vote share in most districts to rise from June to November. That could help the Democrats in some of their targeted seats in November — but lower Democratic turnout in June could prevent them from advancing candidates to November. — If the combined Republican two-party vote is below 50% in the June primary, the Republicans are a clear underdog in the fall: In three cycles of House elections, the Republicans have never lost the two-party vote in a district’s primary vote and then won a majority of the vote in that district in the fall. — One of the Democrats’ targets is Rep. Jeff Denham (R, CA-10), who occupies a seat in the state’s competitive Central Valley. The Democratic vote share in that district is consistently lower in June than in November. If the GOP share of the vote is in the high 50s, as it has been the last three cycles, that might indicate Denham is well-positioned to survive November. However, if the Republican share is just in the low 50s — the only other Republican on the ballot other than Denham is someone who appears to be a minor candidate — that should set off alarm bells for Denham, who had close elections in both 2012 and 2016. — There are only two candidates on the ballot in CA-21: incumbent Rep. David Valadao (R) and engineer T.J. Cox (D). Valadao holds another Central Valley seat that is one of the most Democratic held by any Republican: Hillary Clinton won it by 16 points. But Valadao has won three relatively easy victories in his three elections, garnering vote shares in the high 50s each time. With the first round of voting being a clear preview of the fall — Valadao and Cox are guaranteed to advance to November — see how Valadao does. His proximity to 50% might be telling, one way or the other. As of now, we rate this race as Likely Republican, making Valadao one of the best-positioned Clinton-district Republicans in the country. — Democrats are hoping to target some other Republicans, such as Reps. Tom McClintock (R, CA-4), Devin Nunes (R, CA-22), Mimi Walters (R, CA-45), and Duncan Hunter (R, CA-50). Democrats have not broken 40% in the combined two-party vote in any of these districts in any of the last three primaries. If they do in one or more in June, it may be an indication that something has changed in these traditionally Republican districts. If not, Republicans probably will come away feeling good about retaining these seats. Of these four, CA-45 is the best Democratic target if only because Clinton carried it by five points even though it is otherwise Republican down the ballot. — Do the Democrats finish below 50% combined in any of their 39 districts and, if so, by how much? A below-50% performance for Democrats in one or more of their districts would not be unprecedented — there are numerous examples of winning Democrats overcoming sub-50% primary vote share over the past few cycles — and would not necessarily indicate true vulnerability in the fall, but such showings would be worth noting nonetheless. Republicans nearly beat Rep. Ami Bera (D, CA-7) in 2014 and 2016, but he should have an easier time in a Democratic-leaning environment and with a campaign finance scandal involving his father further in the rearview mirror. We rate his seat as Likely Democratic, and all but one other California Democrat is rated as Safe (Rep. Salud Carbajal of CA-24 is also rated as Likely Democratic). Obviously, the most important thing is whether there’s a top-two shutout in one or more of the most competitive, Republican-held seats. But watch the other results too as a rough barometer for where things stand in the California battleground heading into the fall. Oh, and by the way, the California vote count will take weeks to finalize. There’s nothing nefarious about this — California uses extensive absentee voting, which adds extra time to the count — but if some of these races are close, it may take a while before the November matchups are truly set. — In Georgia and Texas, Democrats selected women of color over white primary opponents as their gubernatorial nominees, picking former Dallas County Sheriff Lupe Valdez (D) in the Lone Star State and former state House Minority Leader Stacey Abrams (D) in the Peach State. The Battle of the Staceys in Georgia — Abrams and ex-state Rep. Stacey Evans — provided an interesting contrast in terms of both strategy and race (Abrams is black, Evans is white). Abrams’ argument was that the party needed better nonwhite turnout to win statewide; Evans argued the party needed better outreach to white rural areas to make the math work statewide. Abrams crushed Evans and garnered more than three-quarters of the vote, becoming the first black woman to win a major-party gubernatorial nomination. She likely will have an uphill battle in the fall against either Lt. Gov. Casey Cagle (R) or Secretary of State Brian Kemp (R), who advanced to a runoff for the GOP nomination, although Georgia may be winnable for a Democrat under optimal national conditions (we are holding at a Likely Republican rating). In Texas, Valdez faces an even tougher fight against Gov. Greg Abbott (R), although a couple of recent nonpartisan polls have shown Abbott leading Valdez but a hair shy of 50%. We don’t think Abbott is in trouble — if we did, we’d move the race from Safe Republican — but we’re curious to see how much resistance Abbott, or Sen. Ted Cruz (R-TX), encounter as they seek second terms (we rate Cruz as Likely Republican). — The Democratic Congressional Campaign Committee had a good night in Texas, where all of the candidates we believe the committee favored won. That included attorney Lizzie Pannill Fletcher (D), who routed activist Laura Moser (D) in a nationally-watched runoff where the DCCC caught some blowback for posting damaging information about Moser prior to the first round of voting. Fletcher will face Rep. John Culberson (R, TX-7) in November in a typically Republican district that narrowly voted for Clinton in 2016. In Arkansas, state Rep. Clarke Tucker (D) easily avoided a runoff and will face Rep. French Hill (R, AR-2) in a dark horse Democratic target this fall. — Finally, in Kentucky, former Marine fighter pilot Amy McGrath (D) beat Lexington Mayor Jim Gray (D) for the right to face Rep. Andy Barr (R, KY-6) in a competitive but Republican-leaning district. Gray, who entered the race late and seemed like a significant favorite, may have taken McGrath lightly, although she also deserves credit for persevering as an underdog. McGrath, who had the callsign “Krusty” as a pilot, has seemingly won over the DCCC after the committee angled for Gray to run. — We have one ratings change unrelated to the Tuesday primaries. Despite coming very close to winning a special election last year in SC-5, Archie Parnell (D) probably always was a significant underdog against now-Rep. Ralph Norman (R) in a district that Donald Trump won by about 20 points. But Parnell’s hopes may have completely evaporated after a damaging story emerged earlier this week that Parnell had abused his ex-wife several decades ago. National Democrats are pushing Parnell to leave the race and it’s unclear whether the party would have a plausible replacement for him. We’re moving the race off our competitive board for now, shifting the rating from Likely Republican to Safe Republican. — Another ratings change may soon be in the offing: On Wednesday afternoon, news broke that Rep. Tom Garrett (R, VA-5) might drop his reelection bid in the Crystal Ball’s home district, and he parted ways with his chief of staff on Wednesday. Garrett was already renominated, so the Fifth District will not have a GOP primary on June 12 (or a Democratic primary, for that matter: Democrats nominated Leslie Cockburn at a convention in early May). If Garrett does exit the race, the Crystal Ball will shift the open-seat contest from Likely Republican to Leans Republican. The Fifth District would presumably select a format for nominating a replacement, who once chosen would go on to face Cockburn in the general election. VA-5 is winnable for Democrats under ideal circumstances, although Trump won the district by 11 points in 2016 and Ed Gillespie (R), the unsuccessful 2017 gubernatorial nominee, won it by nine points while losing by a similar margin statewide. So the seat would still be favorable turf for the GOP, though as an open seat it might see a larger swing away from the presidential party than a seat with an incumbent. As of this writing (late Wednesday afternoon), we have not received confirmation that the first-term incumbent Garrett was officially not running again, but we wanted to telegraph this move given Wednesday’s reports about Garrett’s uncertain status. — From the “where are they now” department: Former Rep. John Barrow (D, GA-12), a Blue Dog Democrat who lost in 2014, captured the nomination for Georgia secretary of state on Tuesday night. There are no primaries next week, but the big one — California — comes the following week, along with several other states (Alabama, Iowa, Mississippi, Montana, New Jersey, New Mexico, and South Dakota). For a full primary schedule, see the National Conference of State Legislatures website. Odds of a Democratic House takeover remain about 50-50. As the Democratic edge on the generic ballot has dissipated in recent weeks, there has been a flood of second-guessing about whether the Democrats are favored in the House or not. Because we’ve never made the Democrats clear favorites in the House, though, we don’t have any modifications to our outlook. 1. Rep. Andy Barr (R, KY-6) is a former student of Center for Politics Director Larry J. Sabato, and thus Sabato is not involved in ratings decisions in that race. Our current rating in that district is Leans Republican.